Mathew joined BBN as the Office Manager and IT Administrator in 1998. In 2007, he took on additional Paralegal duties. He is responsible for the day-to-day operations of the firm including IT support, vendor relations, payroll, and also manages the firm’s finances and billing. He has assisted the partners on numerous commercial real estate closings and has managed the release, receipt, and analysis of multi-thousand page litigation discovery productions. 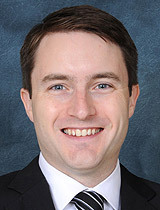 Mathew is a member of the Illinois Paralegal Association.